1	In a deep saucepan heat olive oil over medium heat. 2	Add sliced onions and garlic and sauté until soft. 3	Add tomatoes, sugar, salt, pepper and Italian herbs and sauté for 30 minutes. 4	Blend sauce using a stick blender. 5	Heat a little olive oil in a saucepan and add the anchovies. 6	Saute until they soften. 7	Add the capers and Olives and cook for 2 minutes. Add to tomato sauce and cook through. 8	Serve over pasta of your choice. 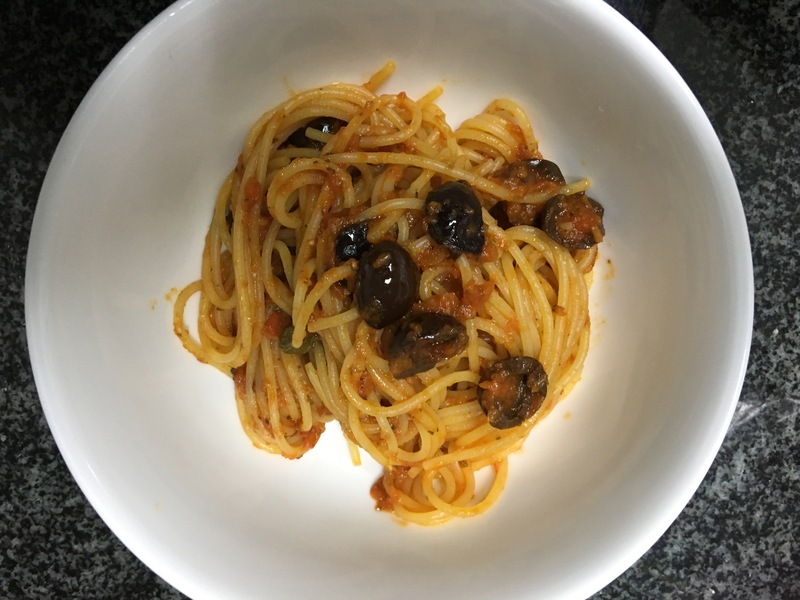 I like Puttansca sauce with Spaghetti or Linguini pasta. 1. Heat the olive oil and butter in a frying pan, until they are gently bubbling. 2. Place the halloumi in the pan in batches, cooking until the cheese is golden – about 2 minutes each side. 3. Set aside in a warm place. 4. Cut the lemon in half, and squeeze generously over the avocado and salmon, season well. 5. Empty the salad leaves into a large bowl. 6. 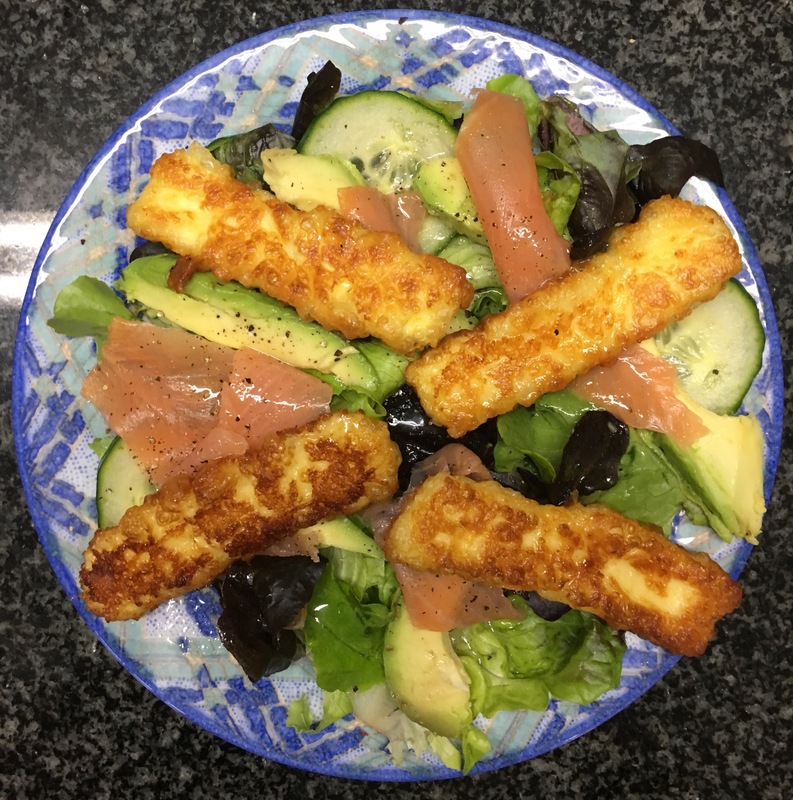 Place the avocado, cucumber, salmon and halloumi over the top. 7. Season with salt & pepper. 8. Mix all the vinaigrette ingredients together. 9. Pour over the salad just before serving. 1	Combine Flour, Oats, Coconut & salt in a bowl. 2	Using a medium saucepan melt the butter/marge, sugar & syrup/honey. 3	Add the Bi carb and stir until it froths. 4	Pour over the dry ingredients and stir to combine. 5	Spread evenly in a baking tray and bake for approx. 20 minutes until golden. 7	Leave in pan to cool. Seasoning – In SA I use Robertons Chicken Seasoning, in USA I use Mrs Dash. Cover a baking sheet with foil and spray with non-stick spray. Slice chicken breast across width way into strips. Lightly beat the egg in a shallow bowl. Season panko and place in separate shallow bowl. Dip the chicken into the egg and then into the panko. Place chicken strips onto baking sheet and bake for 18 minutes – turning halfway. 1. Cube chicken and make a marinade with the Sherry & Soy Sauce. 2. Mix the chicken & marinade. Set aside. 3. Mix the flour, Corn flour, salt and baking powder. Add enough ice water to make a batter the consistency of thick pouring cream. 4. Remove chicken from the marinade and place in the batter. 5. Heat a frying pan and add 1 cm of oil. 6. Fry chicken in batches until light golden and remove. 7. Once all chicken has been fried make the sauce. 8. Mix all sauce ingredients together in a small pot. Heat and stir until thickened. 9. Re-fry chicken until golden and serve with rice and the sauce.